For any of you looking to revive your 435 try Win8 and a ASUS GeForce GTX 650 1GB DDR5 PCI-E Video Card. You can even keep your 360w power supply as this card outperforms the OEM Radoen HD 4850 and sips about 40w less power. Win 8 set me back $15, and the GeForce can be had for about $125. For the first time i can run those Dell Video testing routines without stuttering. I haven’t bothered to overclock it yet but it comes with software that will easily change voltages, clocks etc. The only problem on this model is how Dell put the PCI Express X16 slot near the bottom of the case giving dual slot cards very little room to breathe. Hopefully, things stay cool enough for you. The GTX 650 is a pretty decent card and a good choice for the power supply. 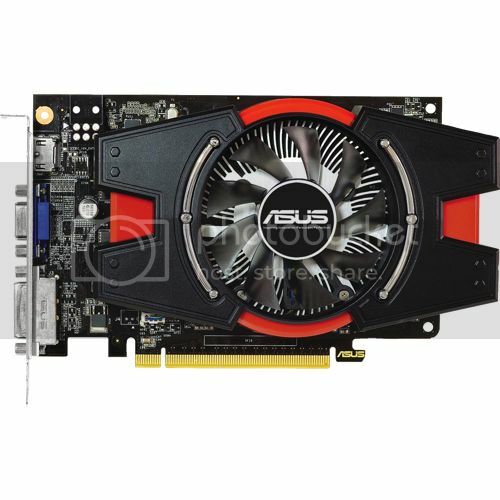 However, for the same cost, you can get the better HD 7770 which would work also. Those old 4800 series cards were real power hogs. I have read that this 650e fits in above the HD7750 but below the HD7770 ... however one test review claimed it could be overclocked to very near the 7770 performance. I may try sometime to do that. But as you pointed out the cramped quarters had me worried about a hotter board like the 7770 .... plus i think a PSU upgrade to 400+ watts might be best for the 7770. I read somewhere that those 4800 ran pretty hot ... i expect thats why mine failed in the confined quarters ... i never thought to check the temps. I think we're always going to have heat problems with the XPS Studio 435mt. The Radeon 4800 were good foot heaters and crashed a lot. But as far as adding fans and updated cards, it can still be upgraded. I recently upgraded a 435mt with an XFX Radeon HD7850 2gb PCIe3 and it runs great. Unbelievably cool. But not all these large cards will fit because of the i/o inputs (front panel controls) on the bottom of the motherboard. I had to remove the fan shroud from the HD7850 to achieve a perfect fit. Some of the later 7000 series cards, you can't do that because there cooling processes (heatsink or fan configurations) are too large and in the way of the i/o inputs. XFX HD7850 2gb CNFC and Sapphire HD7850 2gb are two which fit. Because they have a heat pipe configureration to clear the i/o inputs. But PCIe3 video cards are compatable. We just don't get the whole beifits of PCIe3. I play a lot of first person shooter games (MoH 2010, Crysis2, BF3, CoD2mw, 2142, etc.) and I've seen my frames per second move from 25 to 55+ on the low side. How good does it get? I literally had to lower from ulta settings so my opponents won't dissappear into the high detail, lol. I mentioned heat, is a problem. With the additon of the HD7850, the card problem with heat was solved. Heat just comes from new sources. The NB (northbridge chipset) and PSU. The NB idle was 145f and peaked at 175f+. These temps may be normal for a laptop, not a desktop. But there are some hardware solutions that helped. Evercool and Startech both make PCIe slot fans. 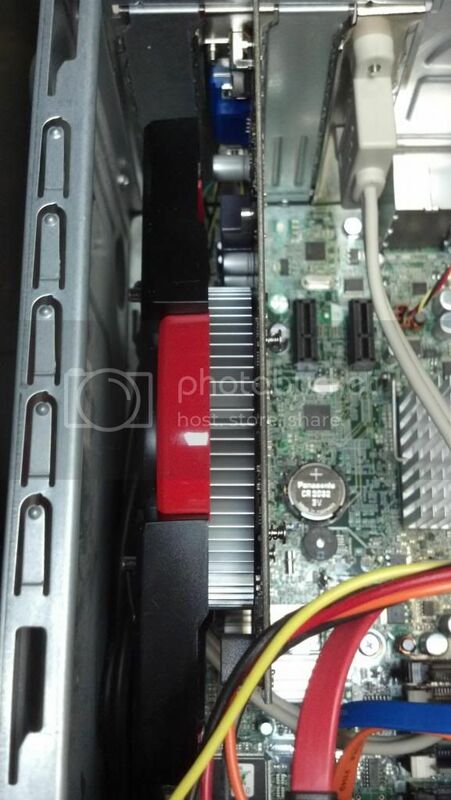 And I found a Slinx ixn40c NB heatsink w/fan and a three 40 mm HDDbay fan that can bring more air in. You can find NB coolers on the internet (NewEgg & Amazon) with fans. I added one 80mm intake fan at the front of the case, under the power button. I routed the power to this fan directly from the PSU. The NB idles at 109f, peaks at 126f+ which is happy. I've been monitoring with SpeedFan, a free app. Makes some noise, not a lot. I also change the PSU. To add a HD7850, card manufacturers recommend a 500w PSU. It's really overkill but I THINK they're thinking, if you add more hardware and peripherals along WITH the 7000 series card, you're going to need the added power to prevent not having enough watts and amps. I got rid of the small 360w 17amp Dell psu and installed a Seasonic 650w 52amp psu. It runs cool. No black screens, BSODs, or freezes (crashes). Also, there is a guy, Col_Forbin on the Dell sites who really made me a student of the 435mt. Very helpful on upgrading. He helped me transfer my first 435mt to another case (infact, I was going to get rid of it). Wow ...... a HD7850 ! What kind of 3dmark11 score would get off that beast? I honestly don't know. I haven't subjected it to a transcendency test, yet. I can tell you though, aside from the glitches in Comcast's download speed, the visual graphics are superb. I'm trying to remember if the card's crashed and I can't think if it ever has. The OS has but not the gpu. I spar with another computer (3770 i7/HD7950) on LAN and on high graphic games it does not flinch. It's really fast on high graphics. It had graphic problems with the AMD Radeon HD6750 1gb in BF3 and MoH 2010 developing less than 25fps (on internet). It studder stepped and warpped, lagging horribily. 128 bandwith and 1 gb wasn't quite enough as these games were requiring more memory to run. Many people where saying, the GeForce GTX560ti & 560 2gb were sometimes lacking in frame rate per seconds (fps). The same with the AMD Radeon HD6850 and 6950. So when the prices started dropping on the 7800 series I started paying attention to blogs, websites as to what everyone was commenting about. By now, you can tell I really like the 435mt. I've thought many times on ditching it but I can't figure a good reason why I should up grade to a new computer. It's an i7. I knew after blogging Col_Forbin (who fitted his 435mt in another case), it could take a HD7850. Most of the hardware problems centered around the i/o inputs on the bottom of the motherboard. The bottom corner of the board hit the i/o inputs so I removed the Xfx HD7850 CNFC fan cover. It fitted perfectly. It doesn't overheat and the fan can be managed if you need it in the Catalyst Control Center program. I tried to fit an HD7950 (I picked up to install in another computer) and it didn't fit. It was blocked by the new Ghost Thermal Tech unit. It doesn't employ the heatpipes the XFX HD7850 CNFC has allowing it fit over the i/o inputs. If you decide you want to put the large PCIE3 card in, make sure it can clear the i/oinputs because the 435mt runs superbly on the 7800 cards. PCIe3 is compatible with PCIe2 boards. It just benifit from the PCIe3 has to offer. P.S. In may last reply, I left the word, 'doesn't' from the last sentence. Sorry, I meant to say, "It just doesn't benefit from all that PCIe3 has to offer." trying to upload my 3DMARK11 score... . Here's what the 3DMARK 11 score is.. Sorry to bring up an old topic but I'm upgrading my 435 MT and would like to switch to a new case. Mind my asking what case you transferred to and any issues involved? I'd like a larger case than the this small one. I didn't change my case .... used the stock case and P/S, then replaced the stock video card with the ASUS GeForce GTX 650 1GB DDR5 PCI-E Video Card. Its still going strong 3.5 years later. Whatever case you get just make sure you get good quality P/S to go with it .... I would say 500w absolute minimum..... would be better with 600-700w. The standard 360w that came with my system was maxing out after just adding a second HD ( and with its original video board). Only my swapping in the low power gtx 650 video card did i gain enough power headroom to keep it working. As the P/S gets older their output starts to fall off .... but maybe you already have a new P/S ? ?